DH and I were talking about the internet the other day. These days, it’s hard to “run out of internet.” There is so much of it to begin with, in addition to the social aspect, the interactive pieces, and the dangerous Bermuda triangle that is Wikipedia that it’s easy enough to waste away an afternoon just click-click-clicking. When we first met, you could still quite easily “run out of internet.” If you ran out of questions you needed answered or topics to read up on, you were done. That, and there just wasn’t the sheer volume of content on the internet then that there is now, never mind any social media rabbit holes to fall down. However, I love gardening for how it roots me back down to what I do love about the internet. The blanket flowers bloom nearly year-round in my garden. They attract the honey and bumble bees, the birds and the butterflies. 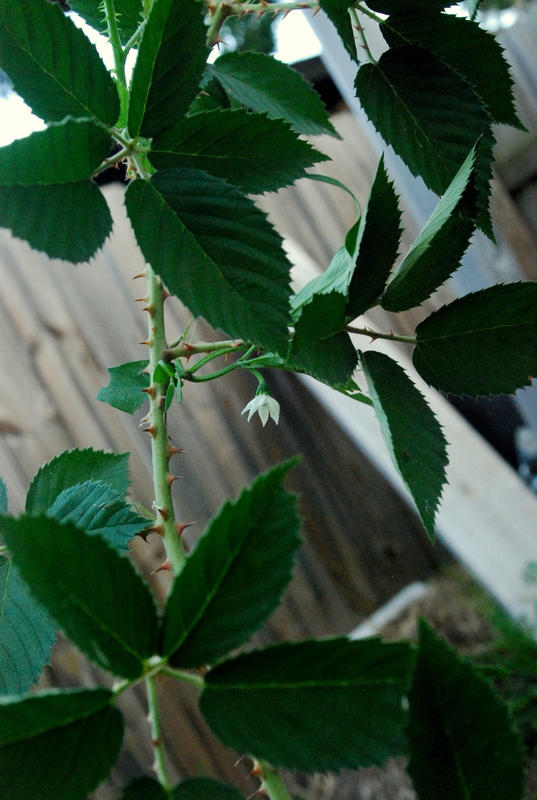 Recently, they attracted a new bee in a shiny black coat that I didn’t know. 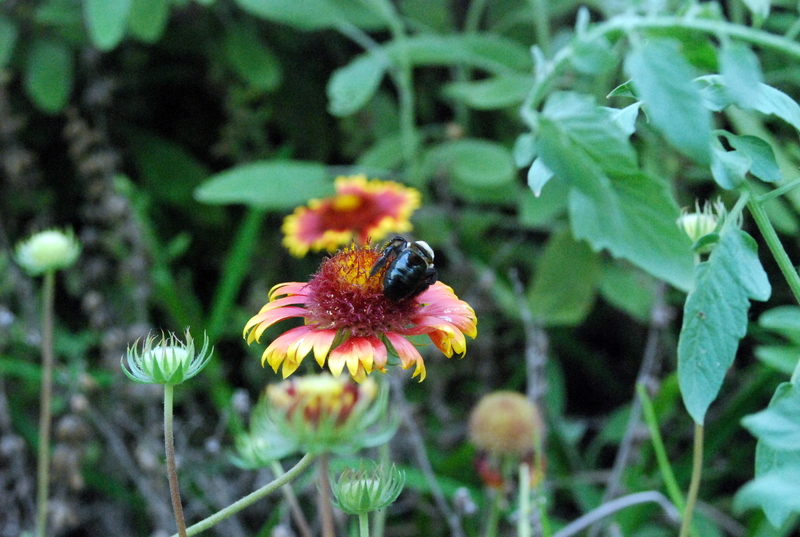 I pulled out my phone, searched, and learned right there in my garden – a carpenter’s bee. 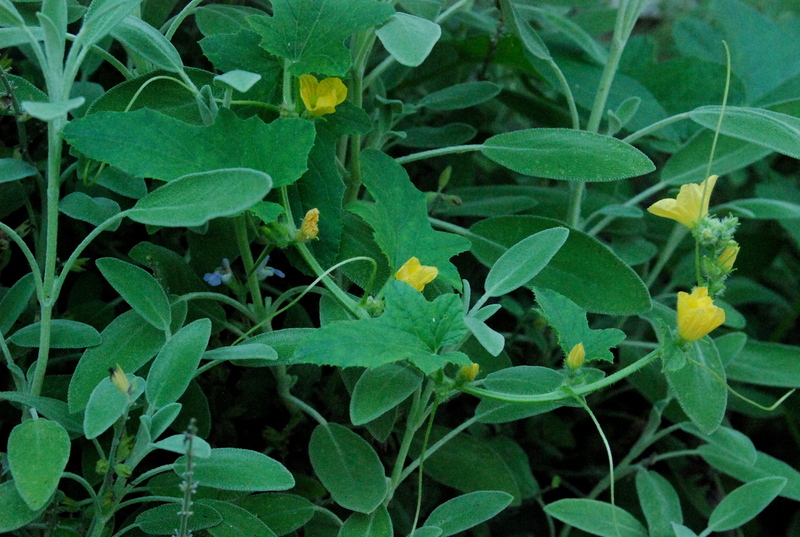 In February of 2011, I cleared out my 100 square foot garden. I ripped the grass, dug three feet down removing weed seeds, grass roots, and June bug larvae. DH built the edging to keep the crawling St. Augustine and Bermuda at bay, anchoring the edging with posts with which to anchor shade cloth and bean string. In January of 2012, I rented two plots in the local community garden. My 100 square feet in which to garden jumped to 500 over night. By May of this year, I realized that community gardening, or at least gardening with that community, wasn’t for me. Even with my stark lack of gardening this year so far, dropping from 500 square feet back to 100 was a bit of a blow. So what’s one to do? Whine and lament the attitudes and personalities of those who made it necessary to leave the extra 400 square feet behind? Nah. That doesn’t solve anything. Unless there’s a complaint quota necessary for being human that I don’t know about…it would solve that. 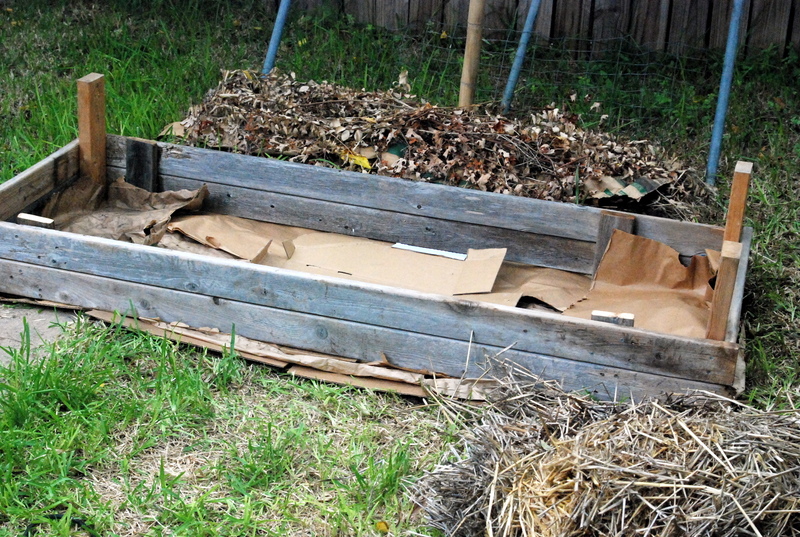 Shannon over at Dirt ‘n Kids has shared her success with a similar climate to mine using Lasagna Gardening. 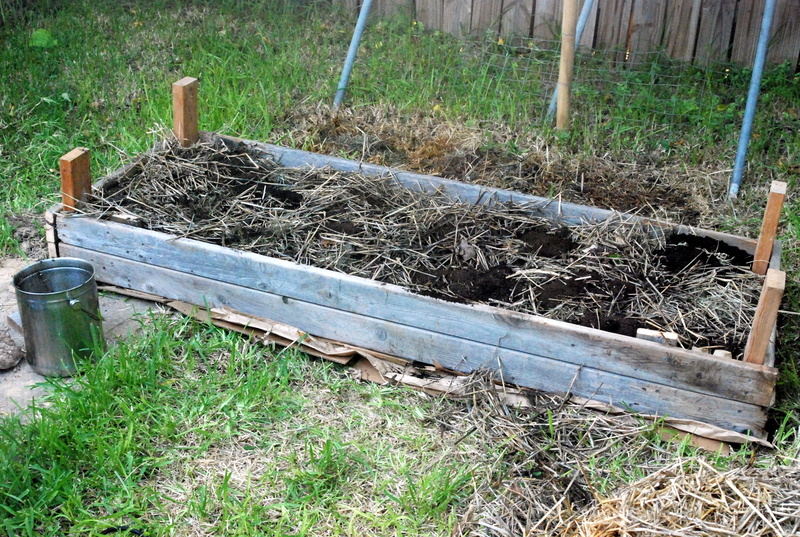 August is not the time to be digging 36″ down through clay and pebbles to make a new bed. I wanted to grow more seedlings of self-saved broccoli seeds (Green Early Heirloom) and Amazing Cauliflower. I wanted to try my hand at some Ruby Moon Hyacinth Beans and Sugar Ann peas. And then…you get the idea. I dug in the garage for a box. I must’ve had this same urge ages ago when I first stumbled upon Shannon’s blog, because there was a large cardboard box containing untreated brown packing paper, a neighbor’s discarded leaf bag, and smaller segments of lesser-chemical-ed cardboard eagerly awaiting the day. I needed boards and screws. DH had gathered a neighbor’s discarded decking for my compost bin and had some extra pieces. I found some excess ends of 2″x4″‘s left over from his saw-horse project. Exterior screws were shelved beside the drywall screws, eye hooks, and other fasteners. I had to choose – 1″ 1/4″ dry wall screws or 4″ exterior screws. I knew the 1″ 1/4″ were too short to bite in properly, and may not weather the outdoors very well. I grabbed the 4″ exterior screws. I didn’t feel like measuring. So many things in life must be weighed and measured, exact and equal. I find gardening to be good practice for my (slightly obsessive) need for accuracy and organization to let go and see that the world doesn’t collapse. The earth and the bugs and the microbes know infinitely more about what they’re doing than I do. The practice of letting them do what they do is soothing in a culture that glorifies busy-ness and demands constant multi-tasking. I made thicker sides by putting two boards together, locking them in place with cross boards. The 2″x4″s were to serve as the corner anchors. I started the assembly…and learned that while too-short screws don’t work well, neither do too-long screws. I didn’t mind that they stuck out. I rationalized the tops would be great places to lash string ends. What I didn’t know was that a too-long screw won’t pull two boards together, it will leave them with a gap. Frustration set in. I went inside and was done for the day. Letting the frustration go, armed with my new knowledge, I picked up a box of 2″ exterior screws and went about the business of removing a 4″ screw, replacing it with a 2″ screw, and repeating my way around the box. The boards cinched together and the box was square. I dug four quick holes to sink the corner posts into the earth. One full of pebbles, one blocked by a concrete over-pour, the other two easy. The bed lowered into place, it was ready for soil-making magic. I had already saved up some trimmings and egg cartons, some hay and compost. I’d even saved it in layers (you can see it behind the bed frame.) It was as simple as cutting loose a strip of layered goodies, carefully lifting it off the ground, and nestling it in the wooden frame. So I’m not sure how much square footage I gained. I’m ok with that. I’m also ok with the fact that the stump of the maple tree we had to cut down in the front yard has finally bit the dust. Giant sponges of carbon to start the fungal map off right made themselves available the very evening I needed them. The creation of a suburban forest floor. I put up the drill and the skill saw. I wrapped and tied the extension cord. The shovel and buckets in hand, it was time to go in. DH had made some grass-fed burger patties and Cinderella squash discs on the grill. And there it was. 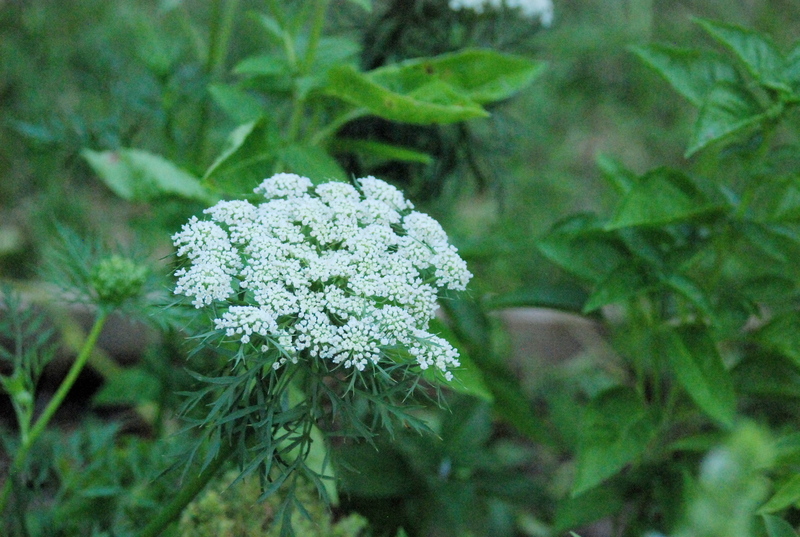 A forgotten carrot lost beneath the returning basil offering up spring’s sowings. It’s a squash, it’s a cucumber, it’s a…melon? I gave them straw mulch over the winter, some sand and compost in the spring, and they gave me strawberries from January through last month. The compost also gave me some volunteers. A few tomatoes that gave up at 18″ tall, a pepper sprout or five that keeled over at 5″, and what is either purslane or a weed I don’t know yet. Another volunteer it gave was what I assumed was a squash. 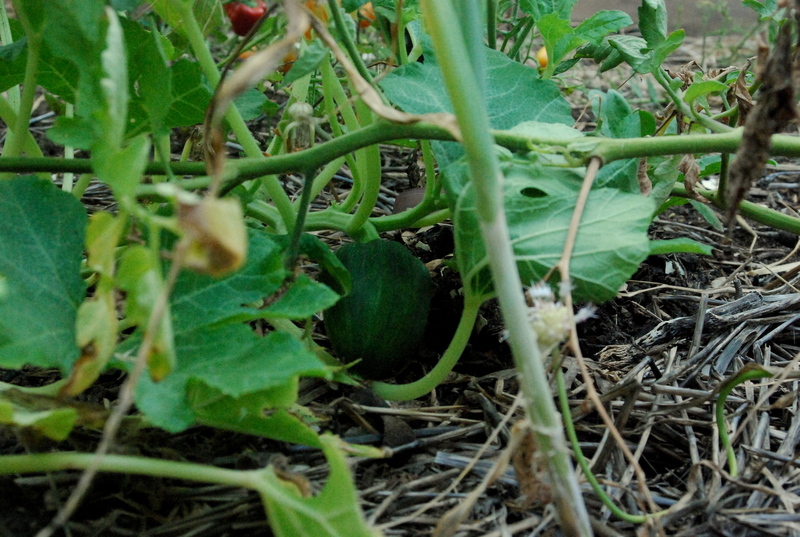 It started with the dark green split leaf sprout of squashes. But then it started to hint that maybe it wasn’t a squash. It wasn’t hurting the strawberries, so I waited to see what it would do next. And then the rains came. Our spring was great for gardening, as I’d mentioned. And by great, I mean that we actually had a spring. That lasted for months instead of days. Even our summer was postponed and when in previous years we’d already had 24 days over 100 degrees Fahrenheit, we’d only had 6. The rains that came soaked the strawberries with purpose and a vengeance. The strawberries laid down in surrender. No one in this house eats watermelon or honeydew. 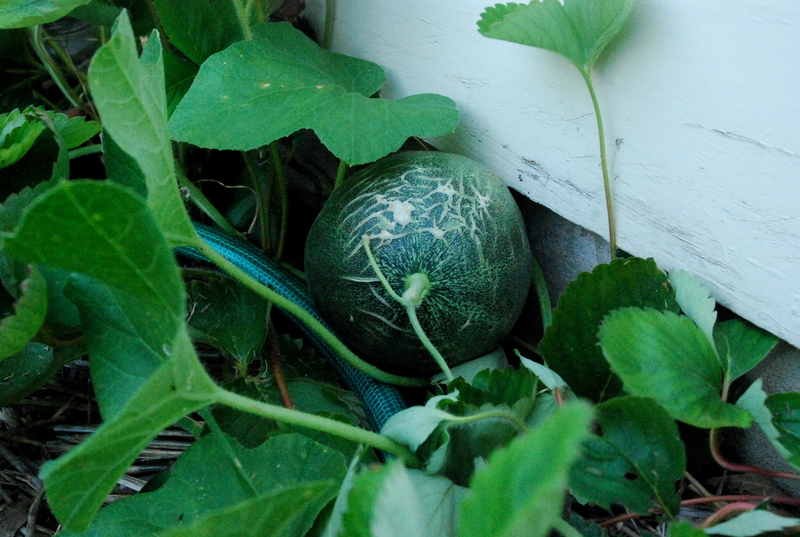 I think it must be some variety of muskmelon/cantaloupe…that looks like a watermelon. Which variety of melon…is the final mystery of this detective novel. Napoleon was one of the first gifts I gave DH. It was 2003 and I was puttering around with my mother. I forget why she was there (tea, perhaps) but I was along for the ride and lost in the succulents section. The 2″ pots were calling to me. 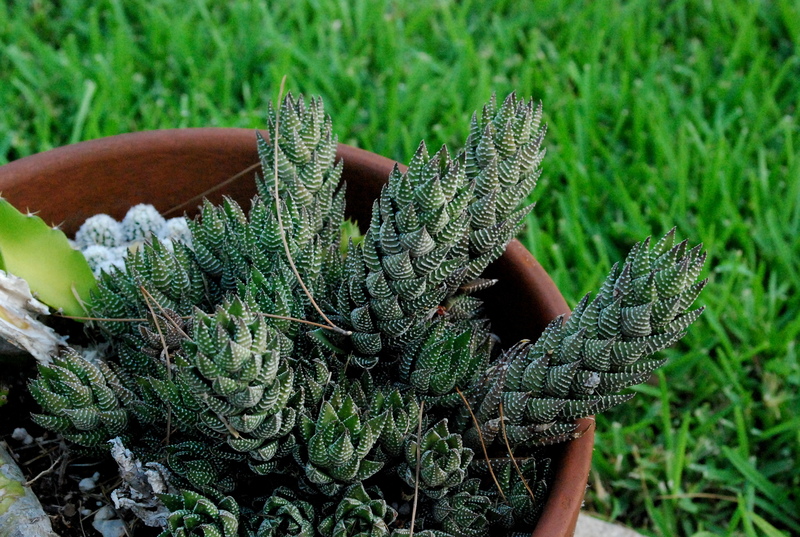 Full of miniature foliage covered in attitude and machismo, they were too cute. One in particular was of a variety I had never seen before. DH is a fan of variegated greenery and so I thought to bring it home as a surprise. Napoleon was named as such due to his size and attitude. At a mere 2″ tall, he would still attack your fingers with gusto if you ventured too close. That, and he was quite the adventurer. He went cliff diving once (knocked off the edge of the sink and into a depth of soapy water) only to respond with an impressive growth spurt. He rode across the country in August in the back of a pick-up through death valley without batting an eye. He’s been forgotten outside in a freeze, left un-watered for months, and only repotted on a whim. This spring was possibly the best spring for gardening in Central Texas since I started gardening here five years ago in pots on a balcony. Unfortunately, it was possibly the worst spring for me for gardening since then as well. With everything working out how it did, most of my garden successes this summer are pleasant surprises. A generational photo. 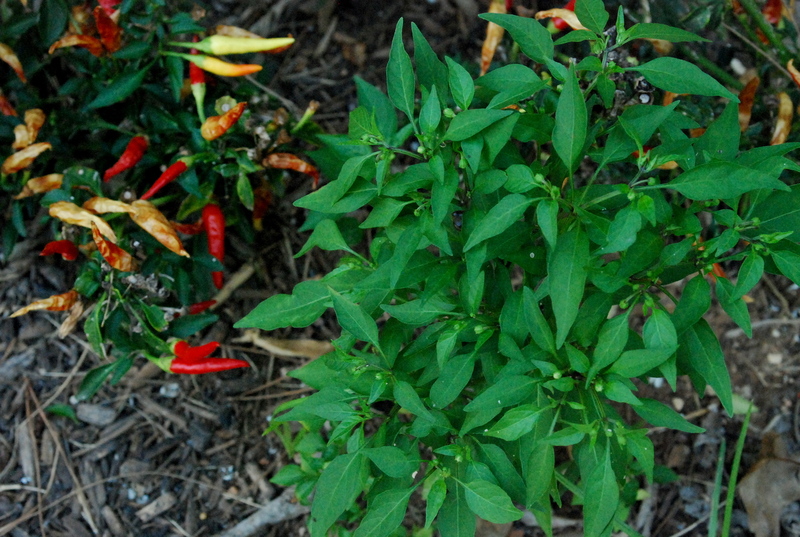 The ornamental (so I’m told) Fiery Chili overwintered last winter, a little worse for the wear on the left. Rewarding my philosophy of “I don’t recognize that as weed or purposeful plant, I’ll let it grow” the chilies that dropped off in the freezes have made new offspring for the season. 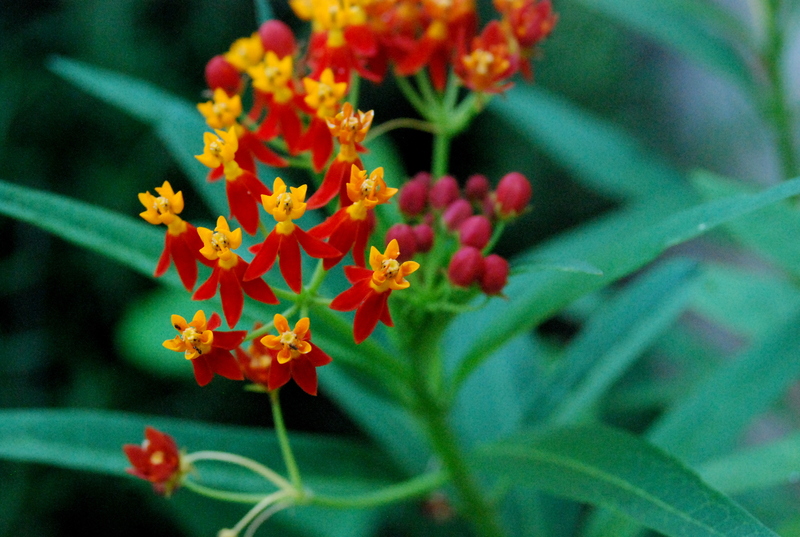 I attempted to grow Butterfly Weed season after season, year after year, and on the actual final seeds in the packet, I finally managed to grow butterfly weed (last year.) It went to seed last fall. 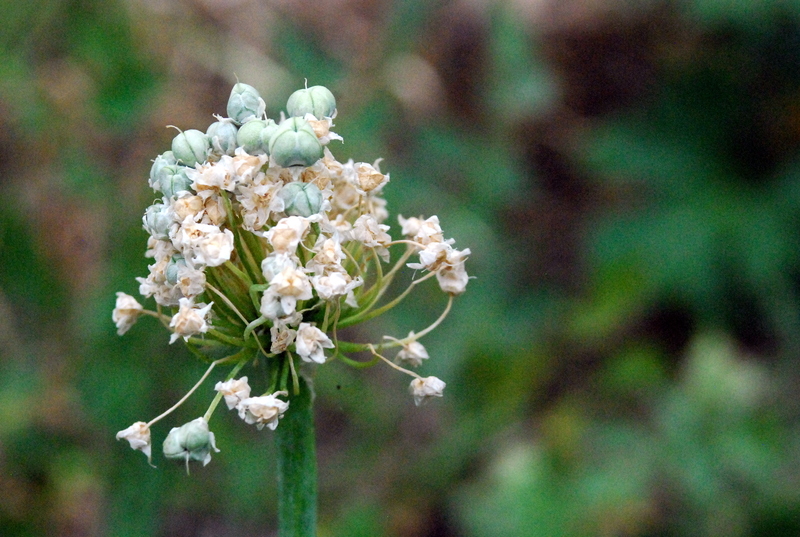 I gathered up the giant wishers (butterfly weed seeds resemble dandelion seeds, if dandelion seeds took steroids.) I tossed them to the breeze. 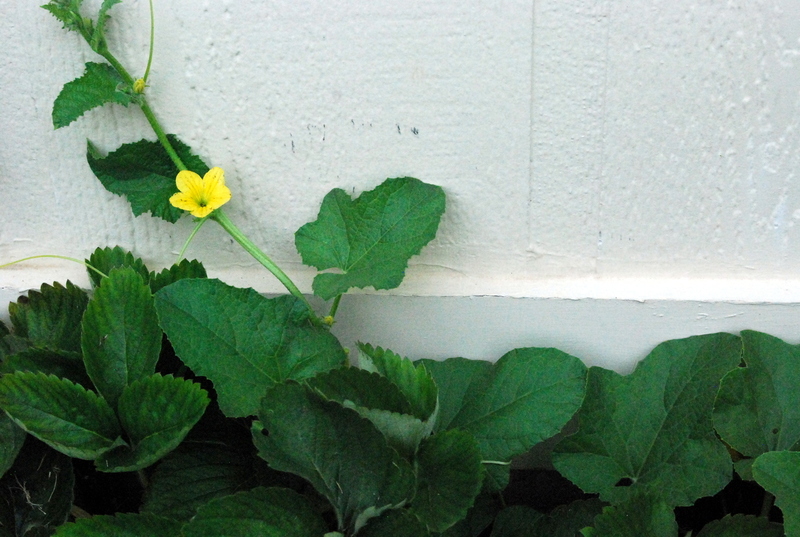 This year the original plant returned to bloom again, along with four new specimens nearby. The bramble or berry? I pruned it down to two main shoots as suggested. 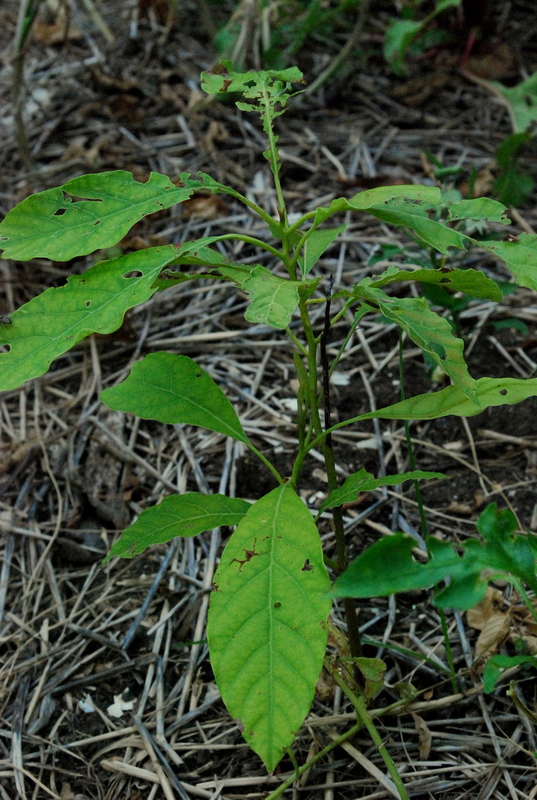 Within the week it had short nubby sprouts in the leaf stem armpits. One of which thought to test the air for pollen. DH is a fan of basil with hints (or brazen) flavors of anise. Thai basil tops the list for him. 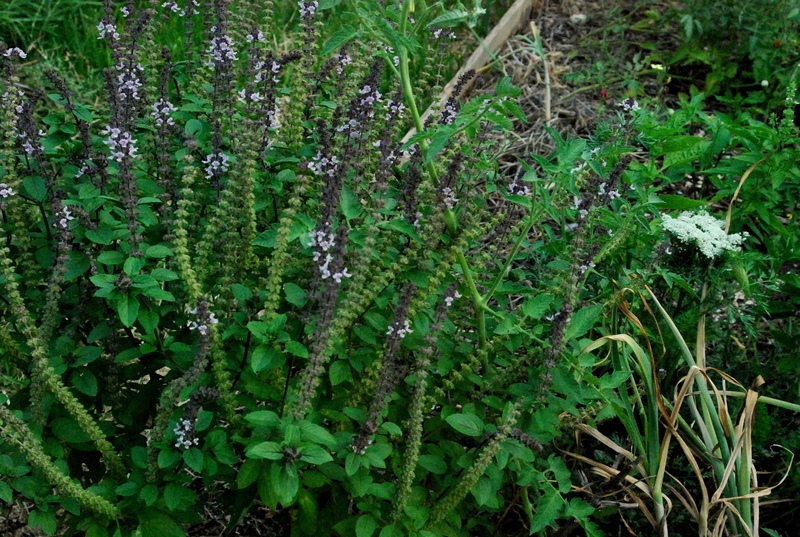 Last year we purchased a small African Blue Basil with an anise nose from our local Green and Growing. It fell off in the frost and I pruned it to the ground. My thought being that the root system would feed the soil and bring joy to the microbes and fungal map. I did not expect it to return…the bees are ever grateful that it did. Volunteer Avocado the 9th. I though to dig him up and pot him last fall, to bring inside with his brethren. I thought further. I already had six his size in pots, not to mention Elian and the middle-sized one. I left him to fend for himself. Fend he did. We had multiple nights last winter hit 24 degrees Fahrenheit and while suffering a little leaf burn, he came back. He’s been frozen, eaten, and burned, and here he stands. Not the most handsome of arborly fellows, but certainly one of the more stubborn. 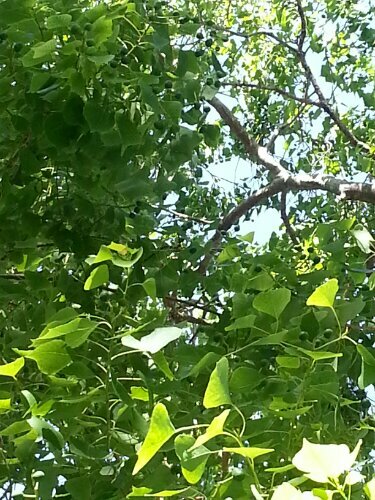 Just sitting in a tree outside the gym waiting for DH to finish up. Hope there are happy lazy days (or at least stolen moments like this one) on occasion in your lives this summer.